Are you taking your kids to a Day Out With Thomas event in 2014? If so, be sure to check out the new animatronic moving face and eyes! Your kids will be quite impressed! Photo: Patricia Vollmer. How many of you have preschoolers and young elementary school-aged children who love Thomas the Tank Engine?My sons have officially outgrown Thomas and Friends, but their years of enjoying Thomas has deepened their love of trains and the engineering sciences in general. My husband is quite grateful for that. I’m a Thomas and Friends veteran. My two sons, starting in 2004, had nearly a decade of the Thomas and Friends Wooden Railway, books, the PBS television series, and Day Out With Thomas. The latter is what I’ll be writing about. I am frightened proud to admit that I have been to twelve—count ’em: 12!— Day Out With Thomas events since 2003, scattered throughout the country. We attended the preponderance of them at the Strasburg Railroad near Lancaster, Pennsylvania, since the Day Out With Thomas event always coincided with my husband’s nearby family reunion every Father’s Day weekend. We have also attended events at the Fremont & Elkhorn Valley Railroad in Fremont, Nebraska, the Mt. Dora and Lake Eustis Railroad (now called the Inland Lakes Railway) near Orlando, Florida, and the Florida Railroad Museum in Parrish, Florida (between Tampa and Sarasota). The Strasburg Railroad’s events have always been the biggest and most crowded. Why? Actually, there are several reasons. First of all, the railroad is a convenient less-than-half-day’s drive from the Washington-Baltimore, Philadelphia, and New York metropolitan areas. Secondly, the timing of the Strasburg Railroad’s Day Out With Thomas event works out well for many families: who wouldn’t like to present Dad with a Father’s Day weekend enjoying trains with his kids? Finally, I personally think the Strasburg’s DOWT’s experience is the most substantial: the baseline ticket ($21) includes rides with five other train-themed attractions at the railroad. For an $8 up-charge, you can add a ride on the standard Strasburg Railroad, which is a 40% savings compared to the a la carte train fare. Over the years, I learned how to conquer this very-crowded DOWT event by ensuring we ride on the very first Thomas train of the day, then allowing the kids to take them time enjoying the other attractions after Thomas. 2014 Day Out With Thomas: Featuring Talking Thomas! Bill Fowler of the Strasburg Railroad answered some questions about the Day Out With Thomas program. Photo: Dave Vollmer, used with permission. This year’s Thomas events across the country are featuring a genuine “talking” Thomas locomotive, featuring a hydraulically-powered animatronic face that synchronizes with pre-recorded sound bytes to absolutely WOW your kids. Last week my family took our annual ride on the standard Strasburg Railroad, but since my sons (ages 9 and 11) have more or less outgrown Thomas and Friends, we didn’t ride with Thomas. That didn’t stop me from talking with one of the Strasburg Mechanical Shop engineers for a behind-the-scenes glimpse at how Thomas is taking to the kids. The talent at the Strasburg Mechanical Shops have been sought out for decades to restore steam locomotives and antique rail cars for tourist railroads and the film industry. You can see evidence of their work in such films as Hello, Dolly, Wild, Wild, West, and Thomas and the Magic Railroad. I met with Bill Fowler, one of the mechanical shop engineers and the gentleman who mounted the seven Thomas faces on their respective replica locomotives before shipping them throughout the country for this year’s DOWT events. My family was over-the-moon excited for a chance to see the engine shops up close and personal. Fowler gave me some fun facts about the Day Out With Thomas events, particularly the animatronic faces. – HIT Entertainment contracted with the special effects company Garner Holt Productions to make the animatronic faces to install on the currently-existing Thomas the Tank Engine locomotives used for Day Out With Thomas. – The animatronic faces use pneumatic air pressure controls to open and close the mouth in sync with several MP3 pre-recorded statements. A computer maintains the synchronization. – Thomas can even speak Spanish! – There are seven Thomas the Tank Engines that travel around the country for Day Out With Thomas. All seven of them received “facelifts” earlier this year. – The Strasburg Railroad hosts America’s only fully functional Thomas locomotive. The other six locomotives are not self-running and require another engine at the opposite end of the train to “push” it. – Of the seven Thomases, there’s the one fully functional one that remains at the Strasburg. The other six can be transported on flatbed trucks to the tourist railroads around the country. There are four standard gauge engines, and two narrow gauge engines that run at railroads such as the Tweetsie Railroad in Blowing Rock, North Carolina and the Colorado Railroad Museum in Golden, Colorado. – One of the narrow gauge Thomases is a 2-foot gauge engine, which is a very small size and runs at railroads such as the Boothbay Railway Village near Bath, Maine. Even though there have been Day Out With Thomas events throughout the country for the past couple months, Father’s Day weekend was the debut of Talking Thomas on the fully-functional locomotive. Mr. Fowler said there had been so growing pains all weekend as the crew figured out how to deal with keeping the animatronic face working with the heat of the water tank. Mr. Fowler revealed to us that on June 23rd the Strasburg Railroad will announce that there’s a fully functioning Percy the Small Engine under construction, projected to debut at the Strasburg’s September 13-21, 2014 Day Out With Thomas event. To close, I want to share the video I took of the Talking Thomas last week at the Strasburg Railroad. You will see how realistic the moving mouth is. You can hear his talking at the very beginning of the video, then you will be able to see the moving mouth and eyes in the later part of the video. Let us know in the comments below if you’re going to be seeing Day Out With Thomas this year, and where you will be visiting him! ← GeekMom Doctor Who Quiz: Which Doctor Said It? I really enjoyed all this post! We are taking our 2 and 5 year old to see Thomas in Oklahoma this year for the first time!! We are so excited! We went to see Thomas at Strasburg a few years ago– in September though, so they must bring him out a few times a year or keep him out for a whole long season or something. We actually decided to just take the regular Strasburg train ride instead of actually riding on Thomas– not only was it cheaper, but we could actually SEE Thomas passing by, which we couldn’t do if we were ON him. My little train-obsessive still got a picture with Thomas and plenty of time to participate in all the other activities as well as ALL the other train stuff at Strasburg (so much! ), so it was a win for all parties. Very cool post! 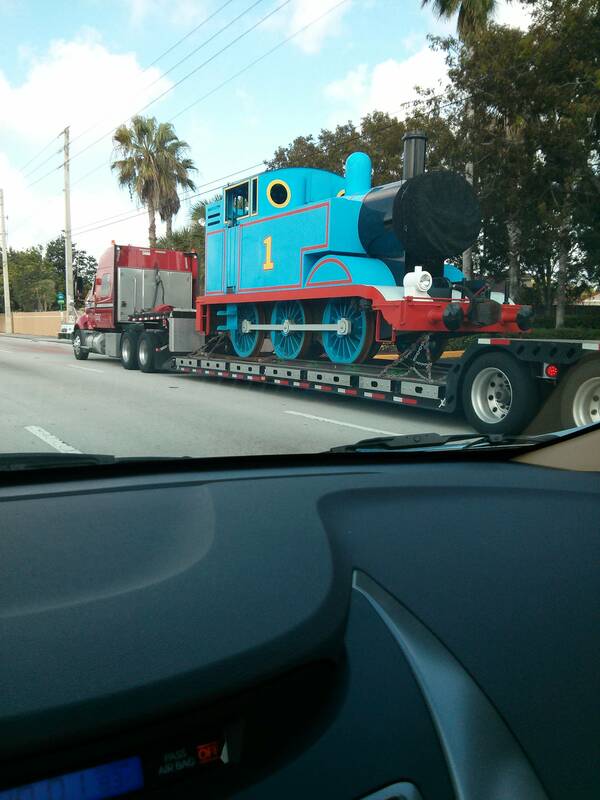 I would love to ride on Thomas! It will be amazing!